Rhode Island’s Medicaid Program serves approximately one-in-three Rhode Islanders, providing access to primary and preventive health care services for children, parents, adults, seniors and people with disabilities. Medicaid is the primary funder for long-term care services that children and adults with significant disabilities and seniors need to live safely at home or to pay for care in a nursing facility or other facility when that level of care is needed. Medicaid supports children in state custody by providing health coverage while they are in care and encouraging adoption of children with special health care needs by providing on-going Medicaid coverage. Young adults who are exiting the foster care system receive Medicaid health insurance coverage until they turn 26, just as they would be entitled to health insurance coverage through their parents’ coverage. Medicaid supports the network of community health centers, helping to assure that these safety net providers are available to all residents in their communities. Hospitals receive significant funding from Medicaid including payments to offset uncompensated care. School districts can receive federal Medicaid funds to pay for a range of health services for Medicaid-enrolled students, primarily those receiving special education services. In state fiscal year 2018, Medicaid spending of $2.8 billion comprised 30 percent of the total state budget. Over half ($1.6 billion) of the expenses were paid for with federal funds. 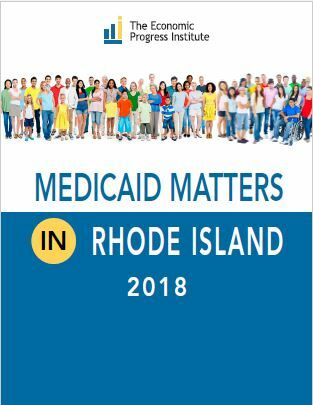 This report provides information about the breadth and scope of the Medicaid program in Rhode Island and includes stories from Rhode Islanders for whom Medicaid provides access to health care and for some, access to services that allow them to remain at home and community. Thank you to the Protect Our Health Care Coalition, who facilitated the interviews and summarized the stories, and to staff at the Rhode Island Organizing Project for helping with this process.